Captured live the same day from the Bolshoi Ballet in Moscow, Carmen Suite / Petrushka comes to U.S. cinemas on Sunday, June 3 only. Carmen is as sensual and free-spirited as ever as she finds herself caught in a love triangle. 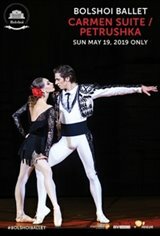 The passionate one-act ballet by Cuban choreographer Alberto Alonso, originally conceived for legendary Bolshoi prima ballerina Maya Plisetskaya, will captivate audiences alongside Petrushka, a new creation for the Bolshoi by contemporary choreographer Edward Clug. The double-bill event for cinemas encapsulates and showcases the soul of Russian Ballet.